1. I Suddenly Have No Hot Water, What Should I Do? If you find yourself suddenly without hot water – don’t panic! It’s usually one of three things. Firstly, your power company may have switched off power to your hot water cylinder via ripple control switch, so give them a call to rule out this possibility as it’s fairly common, particularly after a storm. The most likely scenario though is that either your element or thermostat has failed, in which case give us a call and we’ll sort it out pronto! 2. My Cylinder Is Leaking, Can It Be Fixed? This is a very common question, however if your hot water cylinder is leaking from either around the element or at the base of the cylinder there’s little you can do other than to replace it as its likely the internal tank has rusted out. If however it’s leaking from around the pipes or valves then give us a call as this should be a fairly easy and inexpensive fix. 3. Can I Easily Upgrade From Low To Mains Pressure? The answer is yes and it’s relatively quick and easy with the right cylinder and valves. It’s important to note this job only takes about half a day to complete and you won’t need to replace all your pipes or taps in nearly all cases. This is a common misconception, but the truth is that most taps and pipes are suitable to run either low or mains pressure. So long as you use a mains pressure cylinder and a mains pressure valve pack you can nearly always run mains or high pressure. Upgrading to mains makes a marked improvement to the water pressure in your shower and at your taps by balancing the hot and cold pressure. You may want to also upgrade your shower mixer to get the most from your new cylinder, but this is usually not necessary. There are also inexpensive flow restrictors you can connect to most modern shower heads to reduce the increased volume of water you’ll go through without compromising the pressure. Ask us about fitting one of these when installing your new cylinder. 4. Should I Use Gas Or Electricity For My Water Heating? This is more of an extensive topic as it really depends on your hot water demand and how long you plan on living in your current house. The cheapest option in terms of upfront cost is an electric hot water cylinder, just be sure you get one that’s solar/heat pump ready. This costs only a little more (about $100) than a regular ‘non future- proofed’ cylinder with only a 5 year warranty. We recommend going with a stainless steel cylinder which will have a much longer warranty period because they last. There also seems to be a misconception about the use of Natural Gas (mains piped gas) versus LPG (bottled gas). If you already have mains gas connected to your house from the street, then it is a good option to consider using either an instantaneous gas wall water heater or natural gas mains pressure cylinder. These are more expensive to buy and install than an electric cylinder, but they will save you considerably in running costs. The efficiency of burning LPG is much the same as running an electric element so there’s really nothing to gain using LPG bottles to heat your water as the outlay for the installation is more expensive than an electric cylinder. 5. How Do I Know If I’m On Low Or Mains Pressure? If it’s not clearly marked on the side of your cylinder, as a lot of old cylinders didn’t use to label their tanks very well, then there are a few other ways to tell. Firstly, if your cylinder is older than 20 years then it’s most likely low pressure. If it has a working pressure of 7.6 Kpa or less, its low pressure. If you have a very weak shower or significantly lower pressure at the hot taps than the cold then you probably have a low pressure cylinder. If you have a header tank in your roof cavity or an overflow drain pipe coming out the top of your roof, you have low pressure. If you have hot powerful water blasting out of your shower then you’ve got mains pressure. 6. What Is The Most Efficient Hot Water System? 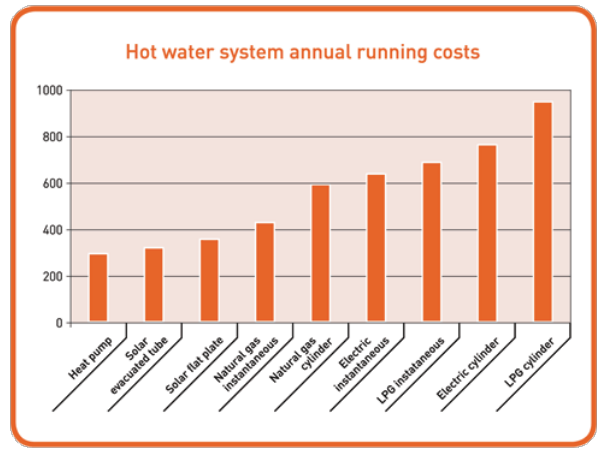 Fortunately EECA (Energy Efficiency Conservation Authority) has done all the hard work comparing various the hot water systems for their efficiency and published the below graph. This shows at a glance that just as heat pumps are the most efficient way to heat your house, the hot water heat pump is the most efficient heat way to heat water. Conversely, LPG and the electric cylinder are the most expensive methods of water heating. For this reason we recommend a stainless, solar/heat pump ready cylinder so you can easily add a hot water heat pump or solar panels now or in the future. 7. Which Is Best, A Solar Or Heat Pump Water Heater? In truth the heat pump water heater is another solar device. It just makes use of free energy in the air (thermal solar) rather than relying on sunshine (solar UV). It does this night and day, even if it’s raining and -15 degrees air temperature outside. It is a common misconception that solar panels on your roof give you free hot water. This is only partly true. As the below graph shows, solar water heaters still use on average over $300 per year in electricity. This is as a result of running an electric circulating pump and the electric element for a good part of the year there’s insufficient. © 2019 The Cylinder Guy. All Rights Reserved. You can often find the age of your system on the cylinder itself, date stamped. Also if your house is over 15 years old then it's likely the cylinder is too. Your installation is covered by our workmanship warranty as well as specific warranties supplied by the manufacturer of the various components, as per their own warranties. Your installation warranty is effective for 12 months from the date of installation; and is activated upon receipt of full payment for the job. The Cylinder Guy will not be responsible for the costs of other plumbing or electrical company’s attendance. Any workmanship related remedial activity must be undertaken by your installing tradesperson or by an alternative tradesperson of our choosing. Any deviation from this must be approved in advance and in writing (via text or email) by The Cylinder Guy Ltd or will cause the warranty to be void and costs will be incurred. All installation work undertaken by The Cylinder Guy Ltd is covered by a comprehensive 12 Month Workmanship Guarantee against any defects raised against the work performed by the original contractor only. Within the standard warranty periods, faults that are covered by the warranty may be repaired free of charge, but calls outside of the warranty period, and faults not covered by the warranty will incur costs. (b) the warranty shall cease and TCG shall thereafter in no circumstances be liable under the terms of the warranty if the workmanship is repaired, altered or overhauled without TCG’s consent. (c) in respect of all claims, TCG shall not be liable to compensate the Customer for any delay in either replacing or remedying the workmanship or in properly assessing the Customer’s claim. For all materials, the warranty shall be the current warranty provided by the manufacturer of the materials. TCG shall not be bound by nor be responsible for any term, condition, representation or warranty other than that which is given by the manufacturer of the materials.